On Thursday 7th March we hosted our 6th SGA Live. With a new venue and a refreshed lineup of keynote speakers, our guests helped to make the day a memorable one and enjoyed by everyone in attendance. Chris O’Grady delivered a valuable insight into the statistics and data of printed magazines which proved to be more than invaluable for advertisers within publications. Mandy Mardell gave an overview of her superb software platform that could help transform the whole pre-production process from flat-planning stage right through to invoicing. Matthew Valentine spoke with Mike Donovan about the latest technological advances in paper envelopment and how this will no doubt have a hugely beneficial effect on our environment. Craig Smith of Ownable demonstrated how through the use of their specific software, they can close the gap between advertising and purchase of product. Something that all publishers could find useful. Mark Francis of Uspire delivered a compelling and enlightening session on how to energise a sales team and also how to make an individual “Upsell” not only themselves but also their company.Director of Your Local Flyer Stuart Oliphant provided our audience with a history of his company and how they have diversified from flyers to magazines and onto hosting their very own expos for their local business community. Increasing their revenue streams all the time. For our grand finale we had the pleasure of listening to Peter Florence MBE, of Hay Festival. Our SGA Live guests listened with intent of how the Hay Festival grew from an initial concept into a world renowned event and a few of the extraordinary stories along the way. 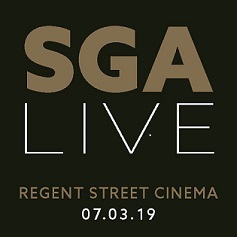 We thank everyone for coming along as we begin our preparations for SGA Live 2020.